How often are you indulging in late night snacks or midnight meals? And are you skipping breakfast but loading up on calories later in the day? Well, it turns out the timing of your meals may be as important to your health and well being as whatever it is you’re eating. 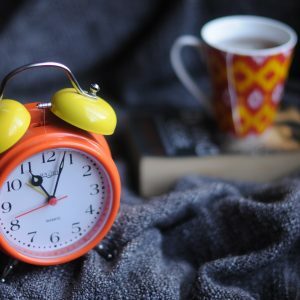 As chronobiologist Dr. Emily Manoogian recently explained in her TED interview and presentation, your body runs on a 24-hour cycle and has natural rhythms that adjust to when you need to be alert, to process food and to rest and repair during sleep. Like a well-maintained car, you run best when you keep to a “maintenance” schedule- and that schedule benefits your body most when you practice “time-restricted eating,” i.e., keeping all your meals within a 10-hour window every day. Sometimes known as “intermittent fasting,” Dr. Manoogian is especially concerned about your nighttime eating. Her advice is to make sure you give yourself at least 3 hours of fasting before bedtime to ensure a properly-functioning body. While this may not be for everyone (especially if you take certain medications or are dealing with disease or illness), it may be a relatively easy-to-implement strategy for better health and well being. As for the meals you do eat, the dilemma for many is always breakfast: Do you need it? Is it healthy to skip it? There is no one right answer to these questions, and it’s often a matter of personal preference and consideration of what you need to accomplish in the morning. But there is a consensus about what nutrients should be part of a healthy breakfast- protein, whole grains, healthy fat, and a fruit or veggie. Want one quick recipe that gets you all four? Pull out your pan and flip here.